Today was “Mulch Day” in more ways than one. We put fresh wood chip mulch down on the paths, which was much needed. We had some holes that were definitely taking on water every time it rained. The mulch should help keep the mud down in the garden. We also put straw mulch down around our tomatoes, peppers, and eggplant. We used about a bale and a half of wheat straw mulch, so yes, we will have some wheat growing out of the straw later on. But the mulch does so many good things for us, that it is worth it. It keeps the soil more evenly moist, which is important if we go through a less-rainy-than-the-rest-of-this-spring period. When it gets boiling hot, it helps keep the soil cooler. It helps smother all the pesky weeds. 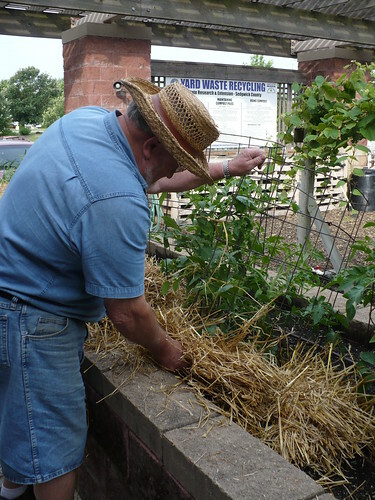 Posted on June 8, 2010, in Working in the Garden and tagged mulch, plant diseases, Tomatoes, vegetable gardening. Bookmark the permalink. Leave a comment.